Preheat oven to 450 degrees F. Chop two peaches into small (1/4 inch) cubes. Let your pie crusts soften, just until you can unroll them smoothly. Cut the dough into circles, with a 3 1/2-inch round cookie cutter. Each crust should give you about 8 circles, so you’ll have about 18 mini pies. Place each pie crust circle in ungreased mini muffin tin. Press firmly against bottom and sides of each cup. Flute and shape as desired. Prick bottom of each cup twice with a fork. Bake 8 minutes or until light brown. Let cool while you make the filling. In a medium or large bowl, beat the cream cheese until light and fluffy (3-5 minutes). While slowly mixing, add the sweetened condensed milk, lemon juice, and vanilla. Stir in by hand, your diced peaches. 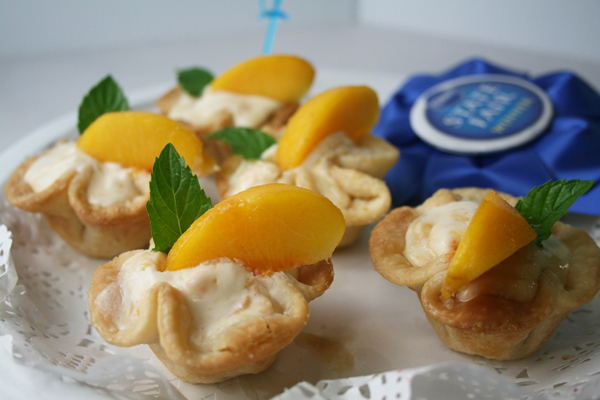 Spoon into baked pie cups. Refrigerate two hours (or longer or overnight) until well chilled and set. Slice remaining two peaches. Top pies with peach slices. Add mint leaf (optional). Makes about 16 mini pies.